Wales' Gareth Bale applauds the fans after the Nations League, League B Group four match at Ceres Park, Aarhus. PRESS ASSOCIATION Photo. Picture date: Sunday September 9, 2018. See PA story SOCCER Denmark. Photo credit should read: Tim Goode/PA Wire. Sam Vokes insists Wales’ emerging talent means they are better placed than ever to cope without Gareth Bale. The Real Madrid star is a fitness doubt for the glamour Cardiff friendly with Spain on Thursday and the Nations League tie against the Republic of Ireland five days later. Bale came off in the final 10 minutes of Real’s 1-0 LaLiga loss at Alaves on Saturday with what is thought to be a recurrence of a groin injury. The 29-year-old talisman has linked up with the Wales squad at their Vale of Glamorgan base, but he sat out training on Monday morning and will continue to be assessed by the Welsh medical staff. “Gareth is massive for us, but we’ve got a lot of players playing at top level now,” Vokes said. “They are playing regularly as well and that can only help us. “If there are players missing there are others ready to step in. Bale, his country’s top marksman, scored his 30th Wales goal in their 4-1 opening Nations League win against the Republic last month. Wales lost their second Nations League tie in Denmark three days after the Ireland victory. 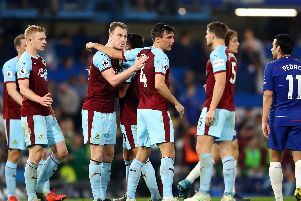 But Vokes says the feel-good factor is back in Welsh football after the disappointment of missing out on the 2018 World Cup. “These are exciting time for us,” Vokes said of the new Ryan Giggs era. “It’s a strong squad now and the new generation of lads coming through is great to see. “We’ve got two good games now and it’s exciting to be back at the Principality Stadium playing Spain. Vokes still needs one more appearance to reach the 60-cap mark after missing out against the Republic and Denmark last month. The 28-year-old is hoping that goals in his last two Premier League games for Burnley will push his case for a recall. “It’s important that I’m doing it at club level,” Vokes said. “It’s important to get the minutes at Burnley and put performances in.